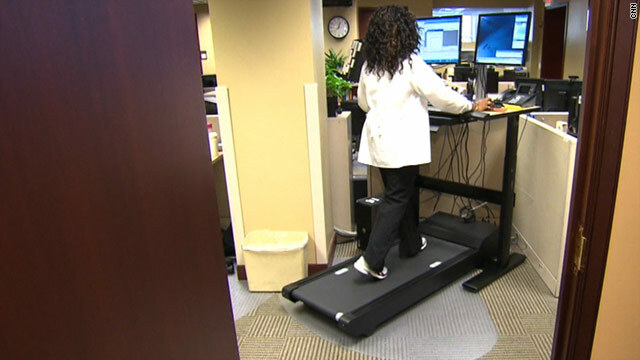 More employers are providing adjustable stand/sit workstations and treadmill desks, above, which run at low walking speeds. (CNN) -- Sitting too much will probably shorten your life. That might sound ridiculous -- or obvious -- depending on your perspective, but the findings don't come from a fringe study. They come from the American Cancer Society, whose researchers studied 123,216 people's health outcomes during a 14-year period. What's particularly interesting about recent research is the revelation that sitting for extended periods of time does significant damage to human health that cannot be undone by exercising. Sitting for several hours each day is bad for you, like smoking is bad for you, regardless of whether you do healthful activities, too. For example, in 1995, the American College of Sports Medicine and the Centers for Disease Control and Prevention jointly issued national guidelines called Physical Activity and Public Health, which were updated in 2007. The government's recommendation was specific: "Moderate-intensity aerobic physical activity for a minimum of 30 min(utes) on five days each week or vigorous-intensity aerobic physical activity for a minimum of 20 min(utes) on three days each week." It's a shift in thinking that is rippling through places of work, schools and homes as the very fundamentals -- chair at desk -- seem to cause harm when used for the lengths of time now considered normal. The Occupational Safety and Health Administration recommends mixing noncomputer-related tasks into the workday, so that you're moving and using different muscle groups. Jeremy Morris found in the 1950s that London's double-decker bus drivers were more likely to die from cardiovascular disease than the bus conductors, and that government clerks were more likely to die than mail carriers. In both cases, the more sedentary job carried greater health risks than the more active job, even though they were in a similar line of work. These findings are also consistent with lifestyles in so-called "Blue Zones," places such as Okinawa, Japan, and Sardinia, Italy, where people live much longer on average than the rest of the developed world. In addition to plant-based diets and strong communities, near-constant moderate physical activity is the norm in these areas. 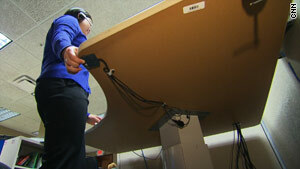 Adjustable desks allow employees to either sit or stand. One such place, the Georgia Poison Center in Atlanta, first installed adjustable desks to allow employees -- who sit for most of the day answering phone calls -- to stand up when they choose. Gaylord Lopez, the center's director, considered the change a success and now has treadmill desks in the office, too. At the call center, Lopez notes, "You've got to stay by your phone, you've got to stay by your computer, so the proverbial walk to the bathroom or walk to the break room was all they were getting. ... That's just not enough. And when you're here 10 to 12 hours a day, I figured there's got to be other things we could do in this environment. "If I can keep someone healthy, I'm going to have a work force that's productive, that's not going to cost me any more money in terms of overtime," Lopez says. "Hopefully, they'll be happy; they'll want to keep on working for us." In the November issue of the journal Diabetes, Dr. James Levine, an endocrinologist at the Mayo Clinic in Rochester, Minnesota, and a leading researcher in the field, points out that sitting has a biological function rooted in evolutionary need -- it's almost as energy efficient as lying down, but while seated, a person can be vigilant of his or her surroundings. "Sitting is not bad for you in moderation, but in excess it is addictive and harmful," Levine writes. "Of concern is that for most people in the developed world, chair-living is the norm."